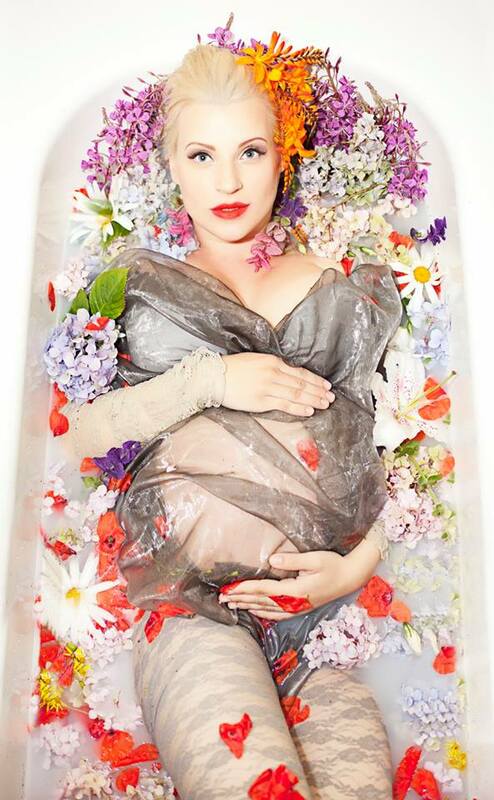 Mom-to-be Vaida Rasciute from Ireland poses in an arty photo shoot showing the range of emotions and cravings during pregnancy. Who knew it could be so beautiful? Anyone who has been pregnant or around a pregnant woman knows those nine months are filled with all kinds of emotions. Some glamorous, some not-so-much. Whatever you feel when you're carrying a baby bump, this unique maternity photo shoot captures it. Back in 2011, then-expectant mother, Vaida Rasciute, an Ireland-based art director and stylist for Carrot Incorporations, with the help of makeup artists Giedre Bereisaite and Aushra Lauren and hair stylist Kristina Sumile, posed in a series of maternity images that perfectly capture the range of feelings many pregnant women experience. "The concept of it came out naturally," Rascuite told Fit Pregnancy. "I was expecting a girl so I wanted it to be pretty and warm," she added sharing that when she looks back at the photos now she feels beautiful and is happy to have the images represent her pregnancy. In the photo series posted on her company's Facebook page, Rascuite embodies common pregnancy emotions like sensuality, pain, and sadness while nine months pregnant with her fourth child. Using gorgeous wigs and dramatic makeup, she takes on the different emotions in a bath full of beautiful flowers and elegant fabrics. Rasciute says these images are meant to reflect those different moods, but each image doesn't have one specific emotion attached to it. "We go through so many stages of moods while pregnant and I would like people to interpret it themselves," she adds. 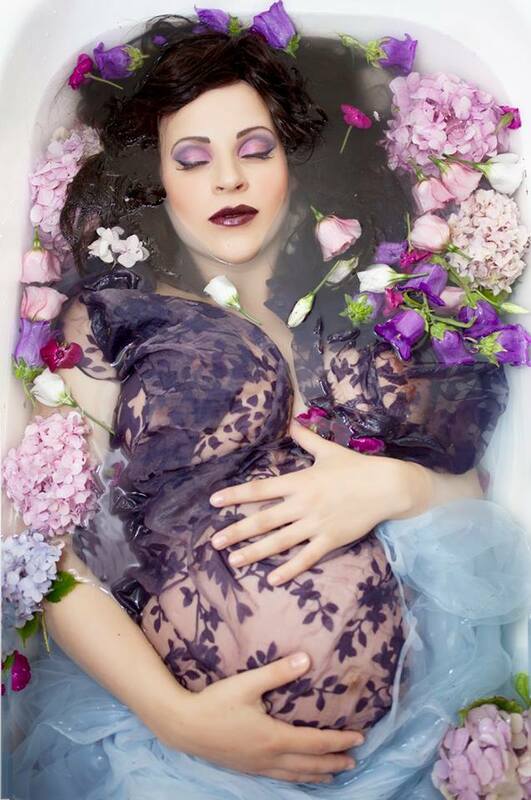 After her fun emotions photo shoot, Rasciute continued the unique pregnancy project with the help of another mom-to-be, this time showing the strong pregnancy cravings she had during her nine months of pregnancy. 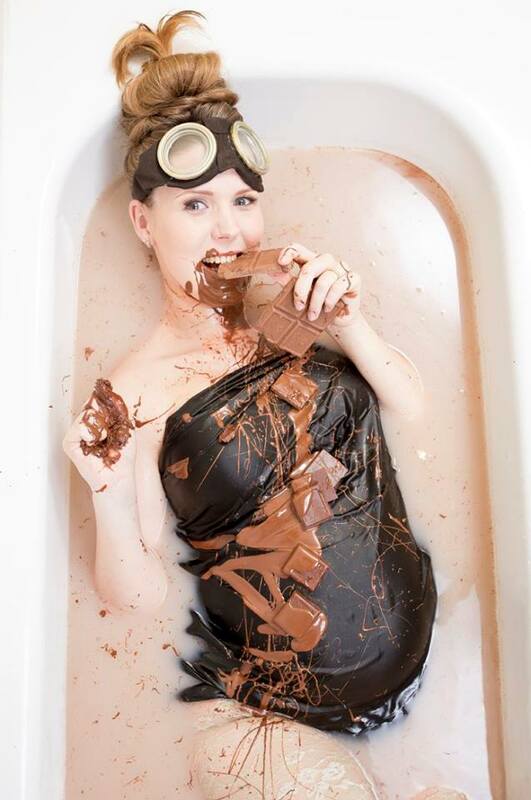 Using the bathtub as a prop, the model is seen playfully posing with chocolate, watermelon, chili and limes, and strawberries in milky water to represent her strong desire for certain foods in pregnancy. Finding new ways to represent pregnancy in photos isn't easy, but this shoot totally nails both the range of emotions and fun side-effects of those nine months growing a baby. Art direction/styling: Carrot Incorporations. Hairstyling: Kristina Sumile. Photos of flowers: photographer Agrita Vindzanova, makeup artist Giedre Bereisaite. Photos of food: photographer CreativeLSPhotography, makeup artist Aushra Lauren.